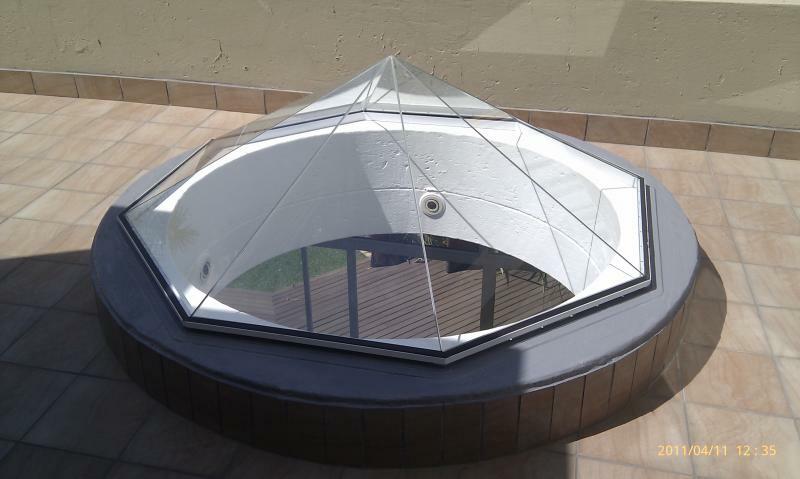 This is a custom glass pyramid skylight which has been fitted and sealed to a brick upstand. Electric remote opening windows are fitted to this skylight to improve ventilation as there are no windows in the room below. 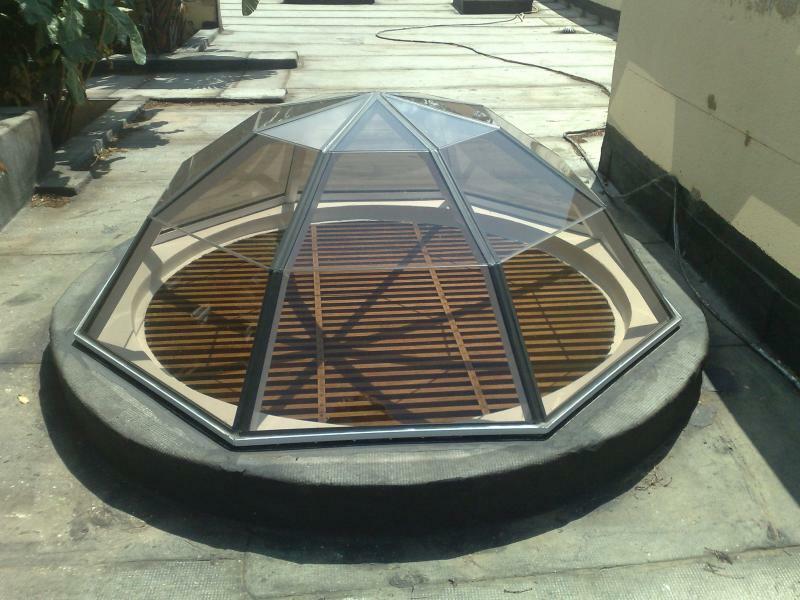 A segmented glass pyramid skylight is shown in this picure. The frame is aluminium and incorporates condensation outlets in the base. 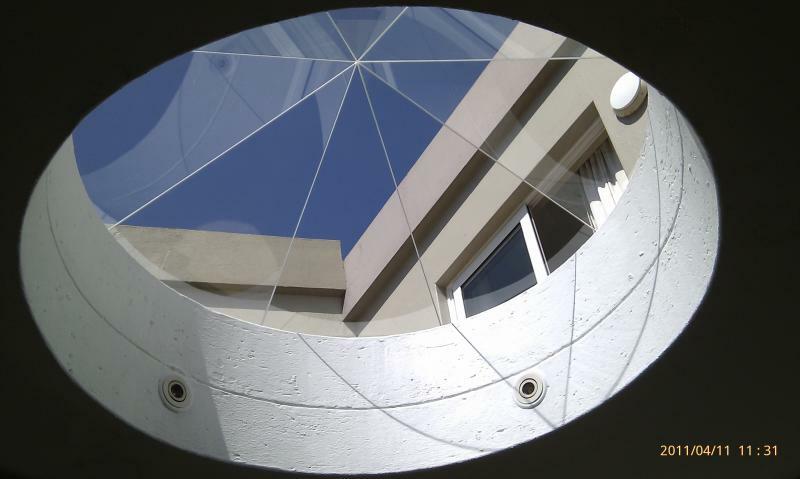 This skylight is designed for circular upstands. This skylight is fitted to a tiled roof which allows natural light to the room below. Note the lead skirt at the bottom of this skylight which moulds neatly to the contours of the tiles. The lead is attached to the under tile flashing, not visible in this photo. 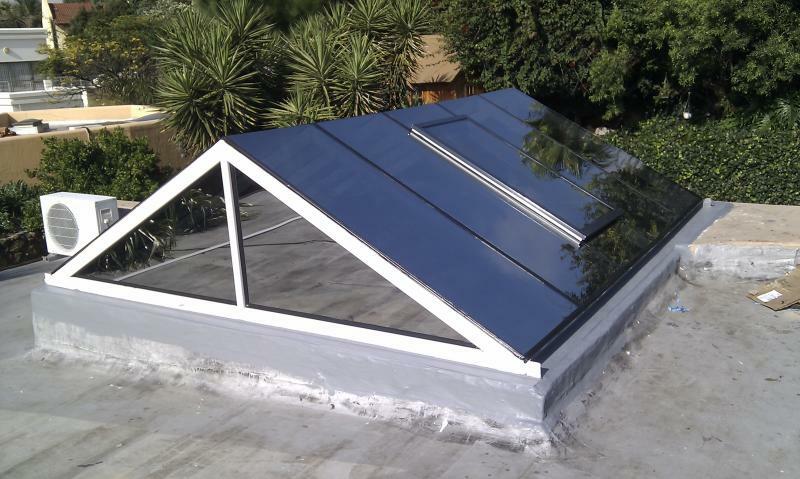 These skylights are available in various sizes and in manually or electric opening units. 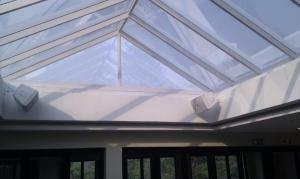 This photo shows a skylight from the inside. The glass on this skylight is S10 silver PVB laminated safety glass and the frame is aluminium powder coated white with condensation outlets. 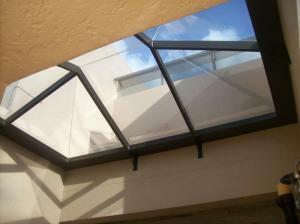 This is a manually opening skylight which is positioned over a shower. 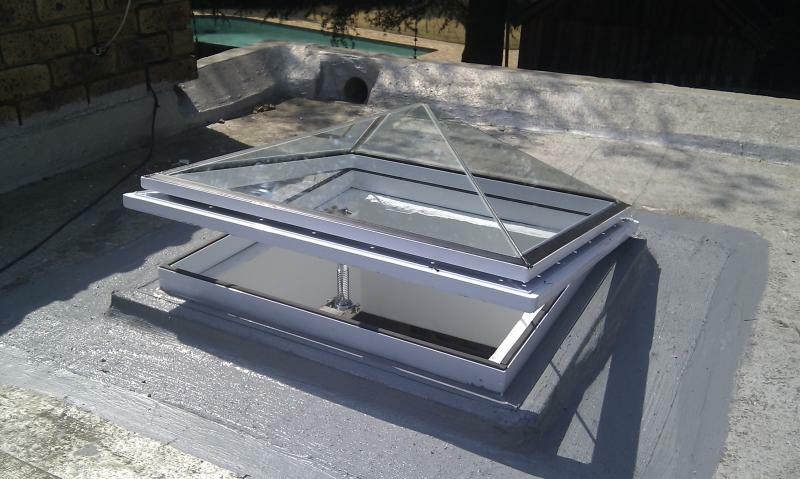 Because there is so much moisture in a bathroom opening skylight units work well to reduce condensation and allow the bathroom to vent properly. Glass to glass octagon skylight (Viewed from outside) custom made to suit circular upstands up to 2 meters in diameter. 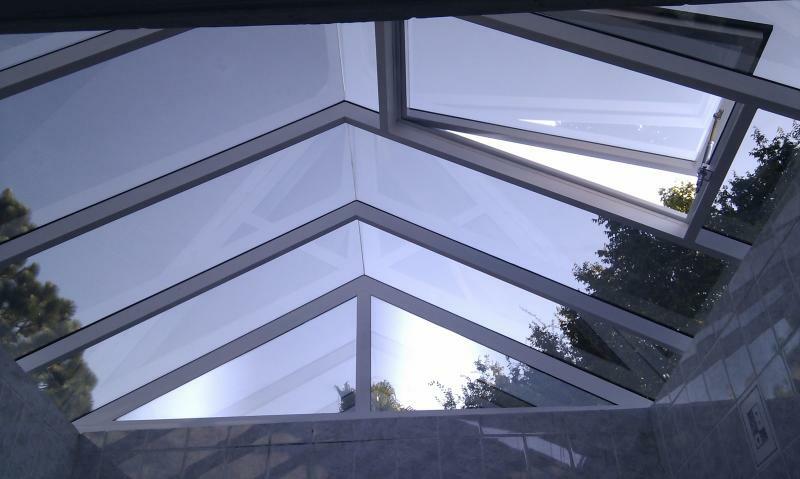 This gable ended ridge pyramid skylight fits as a roof on a large bathroom. A top hung manually operated window has been fitted to this system to allow excess moisture to escape. 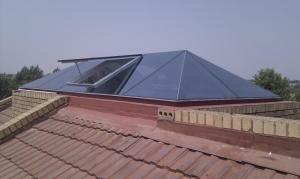 Gable ended ridge pyramid skylight as seen from outside. 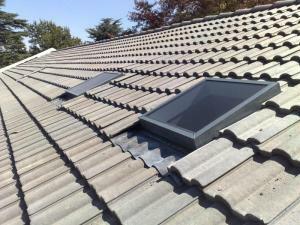 (manually operated window in the closed position). Glass to glass pyramid built above a fireplace accomodating the chiminey.